Despite advances in hardware, networks and browsers, web page performance is not getting faster among the most trafficked ecommerce sites, according to research by Strangeloop Networks. State of the Union: Ecommerce Page Speed and Performance [Fall 2012] reveals the load times and page composition of the home pages of the top 2,000 ecommerce websites spanning July and August. A key finding is, instead of getting faster, the median home page load time is 9% slower than the 2011 study — a drop from 5.94 seconds for first time visitors to 6.5 seconds, and a tumble from 1.86 seconds for returning visitors to 2.16 seconds (a dip of 15%). Full page load time – The amount of time it takes for all page objects to fully load in the browser of a typical end user. Performance best practices – The letter grades assigned to a site for the site’s implementation of core best practices. The top 100 sites suffered even more. 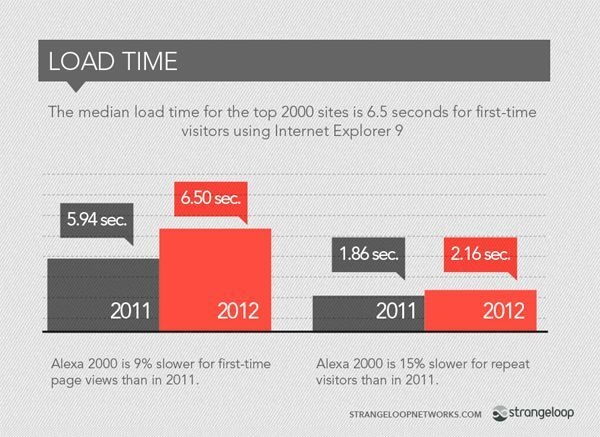 The median top 100 sites were 10% slower than the 2000 with a load time of 7.14 seconds, up 12% from last year. Top 100 sites had 34% more resource requests per page load than the rest of the pack. Images and third-party scripts are the main culprits. The more advanced a site is, the slower it can be. Despite the bloated pages, the performance gap between the top 100 and the rest is smaller than you would expect for the increase in resource requests, suggesting these sites are optimizing using performance best practices. Another finding is the number of page resources across the board rose 5% over 2011. Ecommerce sites in particular are prone to slower pages due to the demand for rich imagery, video, customer reviews, recommendation engines, social sharing buttons, virtual fitting rooms, product demos and various analytics and testing tools employed. Strangeloop also reports the average Internet Retailer 200 site contains 7 third-party scripts, with some containing as many as 25, each pulling resources from different server locations. Each script represents a potential “single point of failure” which can hamper speed or worse, prevent a page load altogether. 12% of the 2000 sites analyzed failed to use keep-alives and 30% did not use compression, the two simplest site-speed optimization tactics out there. The study also found 67% of ecommerce sites are not using a content delivery network to cache resources geographically closer to users to enable faster speeds in different regions. Ecommerce sites should be aware that best-of-breed features and functionality can impact page load speed, which can negatively impact conversion. A balance needs to be struck between them and optimal performance. Common techniques like compression, keep-alives and using content delivery networks can help. 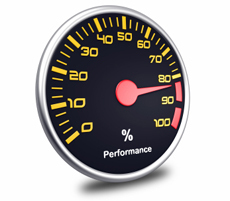 You an also use Google’s site speed optimization checklist. View State of the Union: Ecommerce Page Speed and Performance [Fall 2012] in full (including which browsers proved fastest), or check out the companion infographic.